Accurate diagnosis of the cause of respiratory distress is critical, but can be difficult when the patient has difficulty speaking or multiple chronic respiratory conditions. Diminished breath sounds, wheezes, and crackles can be caused by multiple conditions, including asthma, COPD, CHF and pneumonia. When added to a thorough history and physical exam, waveform capnography is a valuable assessment tool. The shape of the capnography waveform represents air movement through the lungs, similar to how an ECG tracing represents electrical activity in the heart. Capnography is measured with an adapter between the bag-valve device and the mask, or with nasal prongs that sample exhaled air from the mouth and nose. The waveform begins at baseline when exhaled air from the dead space in the upper airway reaches the sensor, which contains no measurable CO2. A spike is seen when CO2-filled air released from the alveoli first passes the nose and lips, and then plateaus when all air is exhaled from the alveoli. The waveform then slopes downward at the beginning of inhalation and returns to baseline. A normal waveform is rectangular shaped, with a slight elevation during the plateau. With bronchoconstriction, caused by asthma, COPD, and sometimes pneumonia, air is released inconsistently from the constricted lower airways. This causes the normally rectangular-shaped capnography waveform to have a “shark-fin” appearance . Bronchoconstriction may also cause a longer expiratory phase, seen as a longer waveform. The more pronounced the shark fin and the longer the exhalation phase, the more constricted the lower airways are. A nebulized bronchodilator, such as albuterol, is indicated when patients have a shark-fin waveform and bronchoconstriction to open lower airways and increase air movement. A rectangular-shaped waveform means that there is no constriction of the lower airways, and that there must be another cause of the patient’s respiratory distress. These causes include fluid in the alveoli, such as from CHF, and excessive mucus secretion in the lower airways, such from pneumonia or bronchitis. While both compromise air exchange and increase the effort needed to breathe, air still leaves the alveoli consistently and generates a rectangular capnography waveform. A nebulized bronchodilator would not help, and may harm, respiratory conditions not caused by bronchoconstriction. A rectangular capnography waveform means that there is no bronchoconstriction, and that no bronchodilator is needed. 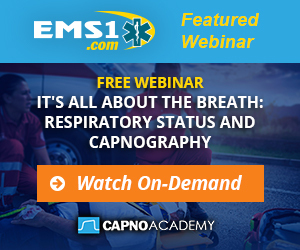 Capnography adds objective data to physical exam findings, which helps determine the severity of respiratory distress. CO2 is a byproduct of cellular metabolism, which gets transported in the blood to the lungs for elimination. The amount of CO2 at the end of exhalation, or end-tidal CO2 (ETCO2) is normally 35-45 mm HG. The height of the capnography waveform accompanies this number on the monitor, as well as the respiratory rate. In severe cases of respiratory distress, increased effort to breathe does not effectively eliminate CO2. This causes CO2 to accumulate in the lungs and more of it to be excreted with each breath (hypercapnea), which would cause the ETCO2 level to rise. Increased work of breathing and CO2 retention may eventually lead to respiratory arrest and assisted ventilation is needed. Respiratory failure from fatigue may occur even when patients inhale enough oxygen, thus having a normal pulse-ox reading. High ETCO2 helps predict respiratory arrest before a change in mentation and decompensation occur, and time to prepare airway equipment. Other respiratory conditions can cause a low ETCO2 reading or hypocapnea. With pulmonary embolism, a blocked pulmonary artery causes less CO2-rich blood to return to the lungs, and less CO2 is released with each breath. Diabetic ketoacidosis (DKA) may present with difficulty breathing, rapid respiratory rate, and low ETCO2 as the body attempts to compensate for acidosis . Shortness of breath from anxiety-induced hyperventilation is caused by an excess of CO2 exhalation. While this is a common and benign condition, its presentation, ETCO2, and capnography waveform is similar to more serious conditions. While coaching the patient to slow their breathing may help improve symptoms when anxiety is the suspected cause of hyperventilation and increased ETCO2, it is important to assess for other conditions. Follow your local protocols for transport of patients with anxiety-induced hyperventilatoin. A decrease in respiratory rate, effort, and anxiety level are signs of both improvement and worsening respiratory failure. Waveform capnography helps make a definitive determination to guide further treatment. The shark-fin waveform changes to a rectangular shape if the patient responds well to a breathing treatment. Other medications, such as epinephrine or magnesium sulfate, may be needed if the shark fin does not change or becomes more pronounced. For patients who present with a high ETCO2 reading, a decrease with treatment indicates that they are getting better. No change or a rising ETCO2 level indicates that respiratory effort is still failing to adequately eliminate CO2, and that more other interventions are needed. A patient receiving supplemental oxygen may need CPAP, and patients whose ETCO2 rises with CPAP may need assisted ventilation with a BVM. While increasing ETCO2 is a sign of respiratory failure, patients can tolerate hypercapnea for long periods once ventilation is assisted . Correction of hypercapnea while receiving mechanical ventilation is a complicated process that must be done in the hospital. Hypoxia is a true emergency, but hyperventilation with a BVM does not help correct it faster. Hyperventilation with a BVM is harmful because it does not allow enough time for exhalation, which worsens air trapping from bronchoconstriction and can cause lung injury. Hyperventilation also increases intrathoracic pressure, which increases the workload of the heart . This is especially harmful in CHF patients whose cardiac output is already compromised. Waveform capnography has been shown to reduce the incidence of hyperventilation . Each squeeze of the BVM generates a waveform and displays feedback on respiratory rate. Use ETCO2 as a guide to ventilate patients 10-12 times per minute, and deliver only enough tidal volume needed to make the chest rise. It is also important to allow patients to exhale completely before delivering the next ventilation — even if the respiratory rate must be lower to achieve this — which can be monitored by viewing the length of the capnography waveform. Waveform capnography is a reliable tool to assess the cause and severity of respiratory distress. Use it to help make accurate treatment decisions and adapt to condition changes. Vanden Hoek TL, Morrison LJ, Shuster M, et al. Part 12: cardiac arrest in special situations. 2010 American Heart Association guidelines for cardiopulmonary resuscitation and emergency cardiovascular care. Circulation 2010; 122 (suppl 3): S829-S861. Davis DP, Dunford JV, Ochs M, et al. The use of quantitative end-tidal capnometry to avoid inadvertent severe hyperventilation in patients with head injury after paramedic rapid sequence intubation. J Trauma 2004; 56(4):808-814, Apr 2004.